The S&P 500 rose 23.43 points to close at 1459.99 on the official announcement of quantitative easing (QE) 3.0 from the Federal Reserve Open Market Committee today. The S&P was hovering under 1440 for the past week until the Monetary Policy release at 12:32 p.m. EST in which the index rose nearly 10 points in the first two minutes. Expectations have been growing for QE 3.0 all year until Bernanke’s Senate meeting in July made it very clear that monetary policy was the only show on the road. Senator Schumer had told Bernanke to “get to work”. Not only did they leave the new policy open-ended, but they also implied that the purchase amounts could increase, adding another layer to QE than previously used. Remember, these were non-traditional policy tools, and as Bernanke has said at Jackson Hole, they’re fine tuning the process with experience. This isn’t just QE 3.0, it’s the 3.0 “plus” edition. Additionally, the Fed’s zero interest rate policy (aka ZIRP) was extended out to 2015. This was widely anticipated heading into this meeting. It was QE that was the wild card. As such, the markets took off straight out of the gate in risk assets. In commodities, silver was the best performing up 4.46% with gold up 2.25%. In stocks every major S&P sector closed up on the day, some better than others with financials up 2.73%, materials up 2.54%, consumer staples up 1.72%, and energy up 1.57%. Within the industry groups, the gold miners were at the top of the list with the market Vectors Gold Miners ETF up 5.02%, the S&P metals & mining SPDR up 4.55%, the Market Vectors Coal ETF up 3.71%, Oil & Gas Equipment SPDR up 2.28%, the Oil & Gas Services SPDR up 2.19%, Bank SPDR up 2.06%, and the Homebuilder SPDR up 2.01%. It was clearly a risk-on day and showed that QE had not been fully priced into the market. The U.S. dollar index fell 0.58%. The 30-year Treasury Bond fell a quarter point to 147 7/32 while the iShares Treasury Bond ETF (TLT) fell 0.27% to 121.68. Technically speaking, the stock market is in good shape, even before we heard about QE 3.0 today. The percentage of stocks in the S&P 500 trading above their respective 50-day moving average is near 83%. The percentage of stocks in the S&P 500 trading above their respective 200-day long-term moving average continues to rise, currently at 77% up 4 percentage points today as many stocks are in clear uptrends. That number can stay elevated above 70% as long as the market trends higher. A move below 70% is a sell signal as I’ve shown in the past and it will be something to watch in addition to price if the market gets concerned about the Fiscal Cliff. Volume has been dropping all summer (typical) but is beginning to increase again since Labor Day weekend, just as the market is thrusting to new 52-week highs – confirming the trend. The major technical level for the S&P 500 to get above was 1420 in August. We did that last week when the ECB announced Outright Market Transactions (OMT) last Thursday. The following day, China announced a $150B Yuan stimulus package. Global monetary policy is causing me to pound the table on risk assets and it all started with Draghi’s forceful tone towards the defense of the euro late July. 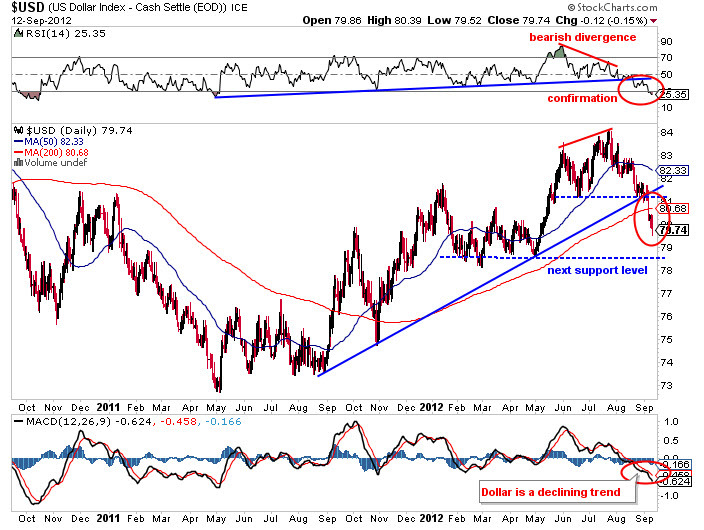 Since then, the euro has bottomed and the dollar has topped. Quantitative Easing is just another monetary policy tool, much like lowering interest rates and reserve requirements. It may not create jobs but it eases credit, increases asset values, increases consumer sentiment, and stimulates spending. It doesn’t solve structural unemployment, unfunded liabilities of the government (in real dollars), or help retirees who need interest income. Monetary policy is the only game in town until Washington gets its act in order this Fall. So for now, enjoy the printed money and the short-term positive effects of rising asset prices. Bernanke is getting back to work.